MBA is a dream degree for many of us. With lots of if’s and but’s we tend to choose a B-School investing worth of one’s 1-4 years of earning. The next level of challenge is the MBA specialization choice. The article is about how the number of factors are vital to be consideration before choose a specialization. Human actions start from either the mind or the intellect or a combination of both. The body executes action. But the body cannot act on its own. •	A combination of the above two. Here is an example of the above three possibilities arising from an action. 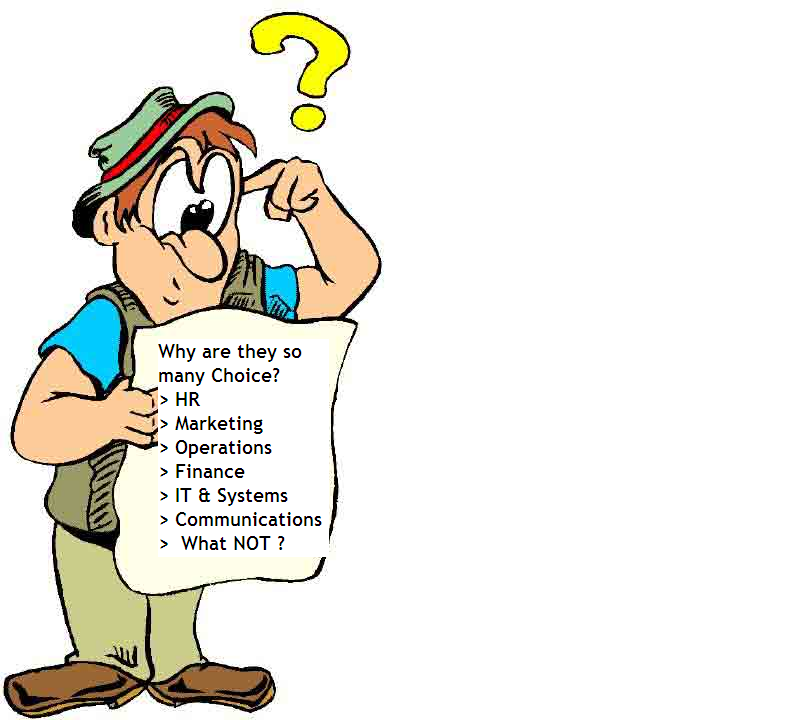 If a student is offered with choices such marketing, finance, HR, operations etc. Students mind wants to opt for HR (lets say) but forced to opt marketing because there is no many takers of HR due to economy hit. The student mind wants to take it. His/her intellect decides against it knowing that the marketing is boom. If his/her intellect is more powerful than his mind he/she will refuse marketing. If otherwise, his mind is strong and intellect weak, he/she would accept it. In a third possibility, if the person is not driven above two choices, his/he r mind and intellect may concur and accept marketing as choice. Most of such choices are not by rational reason and assessment/judgement rather they operate on feeling and emotion. Most of such decisions are followers of their predecessors with little or no investment of thought. Many a times even a choice of professional degree is by mere peer or parental pressure. Our choices shouldn’t be a herd instinct and whims and fancies of the mind. 1 Assessment, Choice, Dilemma, Finance, HR, IT, Loratis Career School, Marketing, MBA, Methodology, Operations, Specialisation..